Abu Dhabi Evening Desert Safari is the most chosen tour of Abu Dhabi where it includes many fun things for first time visitors to Abu Dhabi. Visiting the Desert with amazing activities always will be a great opportunity to experience desert life. 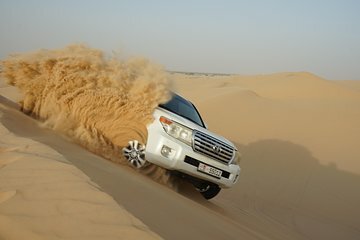 As soon as you been pick-up from any locations in Abu Dhabi, journey by roller protected & insured Land Cruiser to the desert & its take about 45 – 50 minutes from the Abu Dhabi City to the desert point where you can see the herds of camel. Take a ride across the sands on a dune-bashing adventures with Extreme Arabia Safari marshals, experience what it is like to surf on sand with a sand-skiing activity. Watch the sunset, and then go to a traditional camp to get a welcome coffee and dates. Ride on the back of a camel and avail of entertainments such as henna painting, shisha smoking or posing with a falcon in traditional costume, Tanoura Dance &Belly Dance that we make sure all of you happy and smile.